Bank of America Routing Number. Index of all Bank of America routing numbers, including the BOFA ABA numbers for California, New York, Texas, Ohio, Florida, Michigan and all other American states. Please note, that Bank of America have 215 different routing numbers, serving different regions and purposes. We have also included a guide to Bank of America international and domestic wire transfers, plus the BofA opening hours and wire transfer business hours. A routing number,or ABA number, is a 9-digit identification number assigned to all banks and institutions by The American Bankers Association (ABA). The routing number identifies the bank when transferring money or processing checks. Routing numbers are also known as “ABA numbers”, “routing transit numbers” (RTN) or “check routing numbers”. Routing numbers differ depending on where a bank account was opened and depending on the type of transaction. Electronic transactions: When a customer sets up direct deposits (receive paychecks or IRS refunds) or makes outgoing payments to other banks, a routing number is needed. Wire transfers: When a customer receive incoming domestic or international wire transfers, a wire transfer routing number is used. For Bank of America Wire Transfers the routing number is always 026009593. Check Transactions: When a bank customer orders new checks, a routing number is needed. Where can I find my ABA routing number on my check? 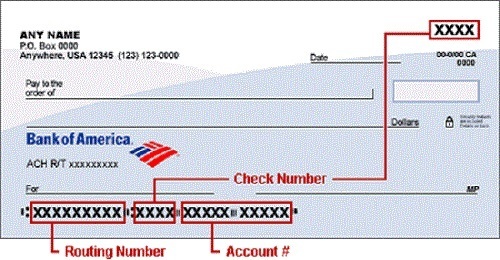 The check routing number is used when ordering checks. You can easily locate your local Bank of America routing number in the bottom left corner of a Bank of America check. Bank of America Routing Numbers. Please note that there are more than one routing number for these states: Florida, Illinois, Indiana, Michigan, Missouri and Texas. If you do not know which routing number to use, then log in to Bank of America Online Banking, select your account and click on the “Information & Services tab”. For ACH transactions, please use the routing number for electronic transactions. For wire transfers, the BofA Routing number is always: 026009593. Below we have listed all 215 Bank of America routing numbers on a chart. For more on Bank of America’s Routing Numbers, please see the company’s FAQ page. International Wire Transfers to Bank of America. Domestic Wire Transfer to Bank of America. You can receive funds to your Bank of America NA account from any bank within USA using domestic wire transfer. Please use wire transfer these details. Wire Transfer Fees for Bank of America. Incoming and Outgoing International Wire Transfer Fees are usually between $15 to $30 per transaction. Incoming and Outgoing Domestic Wire Transfer Fees are typically usually between $0 and $15. Banks also profit on currency conversion, typically 1-2%. Use TransferWise.com or CurrencyFair.com for better conversion rates with lower wire transfer fees. The Wire Transfer Cut-off Time for Bank of America is is 4:45 p.m. CT (Central Time). For transaction requests submitted after the cut-off time, the transaction will be processed the following day. Bank of America Hours of Operations. Bank of America operates in 50 states and in 40 countries. These are the typical branch opening hours, though hours may vary depending on the location. Bank of America Holidays Hours. Bank of America branches are CLOSED on the following observed holidays. Bank of America Customer Service Phone Numbers. The Bank of America customer service phone number is +1-800-432-1000. Call this number if you are unsure of which routing number to use. For technical support call +1-800-933-6262. This number is used for technical queries related to online banking. The Bank of America credit card support phone number is +1-800-732-9194. Bank of America Routing Number FAQ page. Bank of America Wire Transfer FAQ page. Bank of America Branch Locator. ACH Routing Numbers is an acronym for for Automated Clearing House (ACH) routing numbers. This number is used for America electronic financial transactions. An ACH routing number is a nine digit number. The first four digits identify the Federal Reserve district in which the bank is located and the following four numbers identify the bank. The last number is referred to as a check digit number, which is a confirmation number. ACH Routing Numbers are used for direct deposit of payroll, federal and state tax payments, dividends, annuities, monthly payments and collections, etc. The Fedwire Wire Transfer service is the fastest way to transfer funds between business accounts and bank accounts int he US. It is used for domestic or international transactions where the account balance is directly debited electronically and the funds are transferred to an account in real time. To complete a wire transfer, the sender must provide his bank name and account number of the recipient, the receiving account number, the city and state of the receiving bank and the bank’s routing number. Please share your experiences, problems or complaints about Bank of America, in the comment section.